The earliest mention of the Church of St Mary Magdalene (from which the village takes its name) comes in a document which, though undated, can be shown to have been written about the year 1255. At this time both the church and the adjoining community lay outside the Borough of Kenfig. Details concerning them are scant, not least because this village was also known as 'Kenfig' until well into the 18th Century when the name Maudlam gradually replaced it. took refuge in this village, and once the borough's boundaries were enlarged it became the new administrative centre, as it was then the largest community within it. Several of the cottages here today can be traced back to this period. Once the 'new' settlement of Kenfig was established on its present site in the early 17th century, Maudlam began to take on an identity (and eventually a name) of its own. 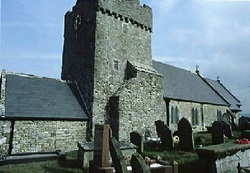 The church of St Mary Magdalene is a simple building with a nave, chancel, and a western embattled tower. Seen when approached along the motorway from the west its situation is impressive, and was made more so in the past by the custom (common in South Wales) of whitewashing the external walls. This in turn made it a useful landmark for shipping navigating the treacherous waters of Swansea Bay. Inside the little church the most outstanding feature is the font. Tub-shaped it is decorated in a carved scale pattern with cable moulding about the rim and base. Believed to be Norman, the quality of the workmanship contrasts so strongly with the otherwise humble decoration of the church that many believe it to have been salvaged from the church of St James in the old town. Amongst the memorial worthy of note is one in the nave to a carpenter named Evan Lyddon who died in 1737. This proudly proclaims him to have been " Portreeve of this Town" which office he actually held on several occasions. In the porch, now re-used as a paving slab, is the gravestone of Jacob Christopher (d. 1676). He was the Nonconformist preacher who was arrested for holding a service at nearby Kenfig Farm and was well respected in the local community and beyond. Sadly the inscription is now in danger of being completely worn away. Outside in the churchyard is the grave of Mary Francis of South Cornelly who died in 1890 at the remarkable age of 110.